Do you need to push forward you car repair business? Want you business to be presented in modern and stylish ways? This template is you choice! 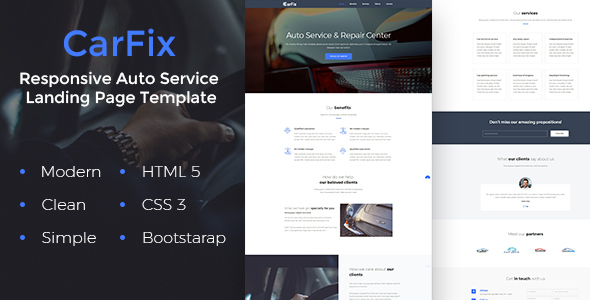 CarFix – Modern, Simple and Fully Customizable Auto Service Landing Page Template. You can change contents to whatever you need. Advertise you car repair services, car rent services, or any other related stuff. There is no large content blocks, so user would not be bored by reading, and you can concentrate their attention on primary services of you business. Just place cool photos and images on this template, change placeholder text to shouting heading, and youre done! Contact form is fully functional (read the documentation on how to change destination email). Your website, built on this template will attract clients, buyers and customers to your auto service. Also, we offer 6 month of support, so feel free to contact us, if you have any troubles using this template. Subscribe to your account, and don’t forget to rate tempalte 5+! PLEASE NOTE: Any media — Images and used in the preview are not included in Template you dowload. © 2017 QuietLab. All rights reserved.